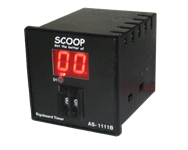 Timers are useful to control the particular process with time limit given by user. 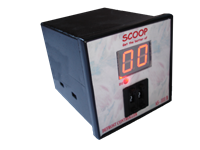 Time Indicator are to indicate the Time of Process / process part done while Time Controller are to indicate the time as well as it takes control over it by given input time through user. So Relay or Buzzer (Alarm) energized for further operation. 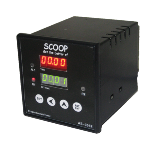 SCOOP is the branded range of Quality instruments having Timer range of 2 digits to 6 digits as well as Sec, Min., Hr & Multirange with START-HOLD-RESET, FORWARD-REVERSE, ON-OFF, UP-DOWN selection. 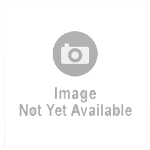 Also Special Types of Timer like Presettable Timer, Cycle Timer, Laundry Timer, Universal Timer, and User define timer. It works on pressatable time. It works on both forward and reverse direction means for some time it will work for forward direction and for some time it will work for reverse direction. we can set the on/off time of the instrument. Using crystal in it we can measure the real time. Using it we can on/off the sign board at desired time. It is used in refrigerator. Using it we can set the time for water disipatation. Using this this we can set the delay for making on/off of the instrument. 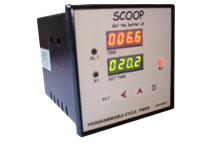 Using it we can control the sequence of process like filling Pepsi in the bottle placed on conveyer belt. : here first we have to give the fix amount of ratio then it will work according to that. 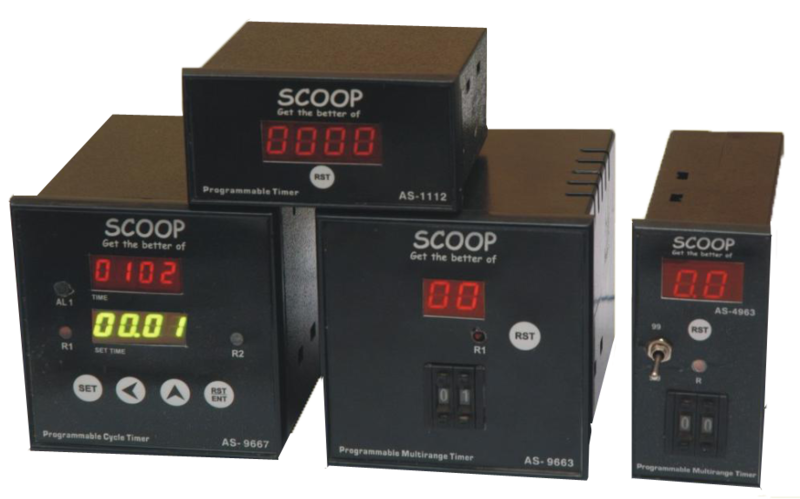 we can use multiple timing in sequence required in process for any process by Multistage Timer. Example: Injection Molding Machine. We can fix the time to achieve particular temperature. In the sequence timer if we want to count the no of object ,we can count it using it. Using this we can measure more than one time at once.